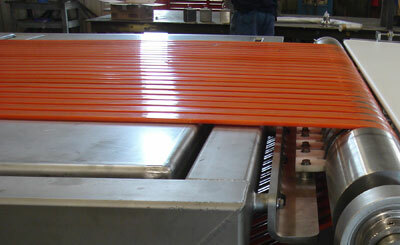 Veethane extruded V-belting is a thermoplastic extrusion. It combines strength with flexibility. It has a coefficient of friction greater than rubber, and maintains its characteristics over a wide temperature range. Because Veethane is made from a pure Polymer, it has a nonporous surface which will not attract lint or dust, absorb fats or greases, or harbor bacteria. The user can cut Veethane to length and heat seal it, even on enclosed drives, so inventory problems and downtime are reduced. There are three types of Veethane. 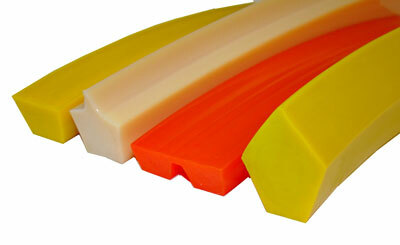 Yellow standard Veethane is urethane and primarily used for conveying applications. It is highly flexible and heat resistant. FDA/USDA Clear Veethane has the same basic composition and performance characteristics as Standard Veethane and is accepted for food applications. Hi-Cap Veethane, extruded from Polyester, is primarily for power transmission applications. It is virtually impervious to common industrial contaminants that can weaken or destroy rubber v-belts. And because Veethane has no internal cords, it can absorb sudden shocks without stretching or breaking. It is accepted by the FDA/USDA for use in the food industry. Veethane has a high resistance to wear and can be used to convey abrasive material such as cinder blocks, grinding wheels and objects made of glass, metal or plastic. Veethane is non-marking, so it is excellent for conveying paperboard packages. The pentagonal Veethane is ideal for conveying glass or tile. Hi-Cap Veethane can replace belts in many drive applications. Matched sets of Veethane are easy to install on multiple belt drives by measuring them to the same length before bonding. Veethane should not be installed in cross drive applications or as a "slip" clutch.